Elmer Fudds of the world rejoice. Arby's -- fast food some people think you've been sleeping on -- has made a habit of trying out meats and sandwiches few chains are willing to give a go. Over the last couple of years, it has cooked up venison, elk, lamb, deep-fried turkey, porchetta, turkey legs, and pork belly. You can add duck to that list. 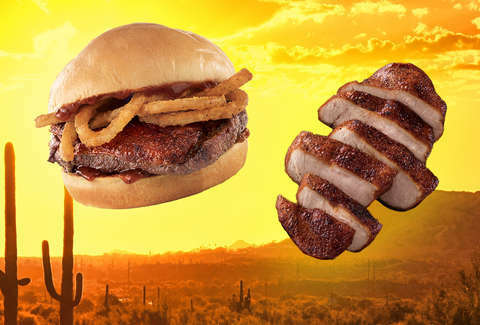 On Saturday, October 20, Arby's will introduce a one-day-only run of Seared Duck Breast Sandwiches at a handful of restaurants across the United States. Arby's said it selected the restaurants involved because they're close to "waterfowl migration flyways" and because of their "proximity to actual duck hunting locations." Each restaurant will have a limited number of sandwiches available, so you probably have to get there early on if you want to make sure you're finishing the lunch hour with a duck sandwich in your belly. Like with other game meats Arby's has sold in limited runs, sourcing is a challenge. The duck for this run comes from Maple Leaf Farms, a family-owned farm with an eye on sustainability. It's seared and cooked Sous Vide before being topped with crispy onions and a smoked cherry sauce. One restaurant in each of these cities will have the sandwiches available: Cambridge, Maryland; Summerville, South Carolina; Wyomissing, Pennsylvania; Atlanta, Georgia; Pearland, Texas; Kalispell, Montana; Great Bend, Kansas; Lincoln, Nebraska; Marshall, Missouri; Jonesboro, Arkansas; Lafayette, Louisiana; Onalaska, Wisconsin; Chico, California; Carson City, Nevada; Brigham, Utah; and Happy Valley, Washington. Additionally, Arby's is partnering with Ducks Unlimited, a charity that works to conserve, restore, and manage wetlands and associated habitats for waterfowl across North America. The chain will make a donation to support the organization's work.